: Did you know that the book "The Purpose Driven Life" has been a factor of transformation for thousands of lives all around the world? Rick Warren is the pastor of one of the biggest churches in the USA? the music in this album was carefully selected to go with each one of the principles of "The Purpose Driven Life"? 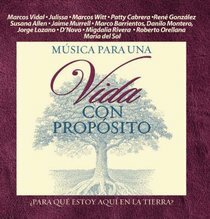 About "Musica Para Una Vida Con Propsito (The Purpose Driven Life Series)"
Order now to secure your copy when our stock arrives. Other edition is available. 9780310337355 0 Available. Expected to ship in 6 to 7 weeks from Australia.